Note that the embryonic lens is basically a "bubble" of epithelium, the lens vesicle, which invaginates and pinches off from the surface ectoderm. (The formation of this vesicle is induced by the underlying optic vesicle, below.) Cells forming the front layer of this vesicle mature into simple cuboidal epithelium, while the cells forming the back layer elongate into lens fibers. The retina also forms from a vesicle, the optic vesicle, which evaginates from the neuroectodermal diencephalic vesicle. This vesicle does not "pinch off" but remains attached to developing brain; the connection between optic and diencephalic vesicles becomes the optic nerve. The optic vesicle itself collapses into a cup, as illustrated above. 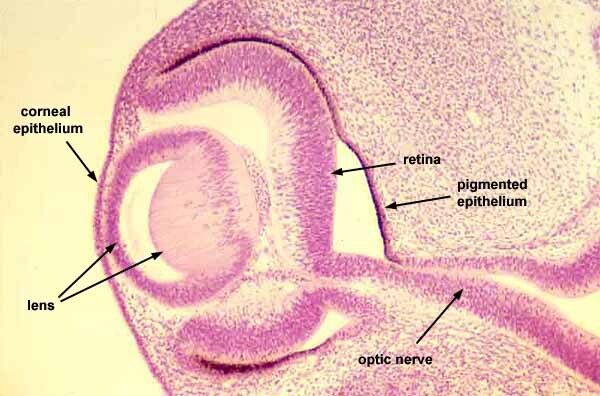 The front surface of this vesicle (the hollow of the cup) becomes the neural retina, while the back surface becomes the retina's pigmented epithelium.